Repeated variations on a theme play out continually in nature. Variations like the micro-scale formation of snow crystals we imagine, the large-scale diurnal and seasonal cycles we experience, or the many variations of fresh and saltwater waves we see. Traveling waves like those created by a pebble tossed into a still pond. The underlying theme of a breaking wave is that the wave steepens until its crest becomes unstable, then breaks. "The world is full of magical things patiently waiting for our wits to get sharper." A shore break is grand, unrelenting, ever-changing, yet somehow the same. 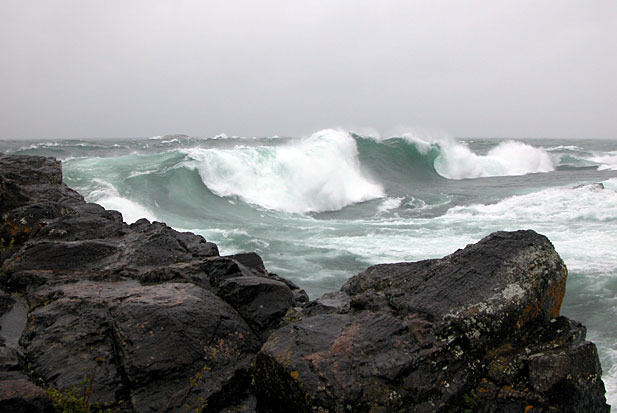 Breaking waves are the narrative of the ebb of flow of energy and the story of entropy. Each wave builds, crests, and dissipates its energy into a rush of white water. Breaking waves fit into the cosmological theme of well-ordered to less well-ordered that plays out continually in nature. Observing breaking waves is calming and meditative, if not hypnotic. Waves embody the repetition of a pattern. They demonstrate the infinite and subtle variations on how a single pattern can unfold. The beginning, the middle, and the resolution of a wave is the same on a grand scale, but infinitely different in detail.